Enjoy attractive interest returns and opportunities from FX investments. Premium Account (PA) offers you the opportunities to earn attractive interest returns and potential growth from foreign exchange (FX) investments. Please note that, FX investments are subject to exchange rate fluctuations which may create both opportunities and risks, including the possible loss of the principal amount invested. Contact our Investment Service Hotline at (852) 2860 0333(852) 2860 0333 or visit any Citibank branch. A wide choice of 11 currencies – HKD, USD, AUD, CAD, CHF, EUR, GBP, JPY, NZD, SGD & RMB. Flexible tenor - from 1 week to 6 months to cater for specific investment needs. Strike Price at your choice - set your own exchange rate at, above or below the market price. Professional experts - our Treasury Specialists can help you identify opportunities and offer different strategies to your portfolio to address market change. Various trading channels - you are welcome to visit our branches, call our Investment Service Hotline or go to Citibank Online to place a booking. Choose a base currency to start with and an alternate currency based on your own forecast for the foreign exchange market over a defined period of time. Decide on an exchange rate at which you are willing to buy the alternate currency. Upon maturity of the PA, you will be paid your interest and principal in the weaker of the base and alternate currencies, depending on the exchange rate on the Notification Date (refer to the illustrative example below for a clear picture). If the exchange rate on the Notification Date is the same as or higher than the Strike Price, investors will receive the maturity proceeds in the base currency, HKD#. If the exchange rate on the Notification Date is lower than the Strike Price, the maturity proceeds will be converted into the alternate currency, AUD, at the Strike Price^. In some scenarios, for example, if the Bank becomes insolvent, goes into liquidation, defaults or the price of the base currency or the alternate currency is zero or an exchange control or other monetary measure is imposed, the Investors may lose the principal amount invested. For reference, if HKD 100,000 is placed in a one-month time deposit on September 1, 2015, the interest rate is 0.01% p.a. All figures and example above are hypothetical and provided for illustrative purposes only. The return is not guaranteed. The scenarios are not based on the past performance or indicative of the actual or future performance of any foreign currency. The Bank is not making any prediction of future movements in foreign currency by virtue of providing the illustrative examples. It does not represent all possible outcomes or describe all possible factors that may affect the payout of an investment in Premium Account. You should not rely on these illustrative examples when making an investment decision. Indicative PA interest rate as of September 1, 2015. Interest rates change daily. Assumption: The client converted the AUD received to HKD at the exchange rate of HKD 5.4900=AUD 1 on the maturity date. If the base currency is AUD and the alternate currency is HKD, investors will receive the alternate currency, HKD, if the exchange rate on the Notification Date is the same as or higher than the Strike Price. 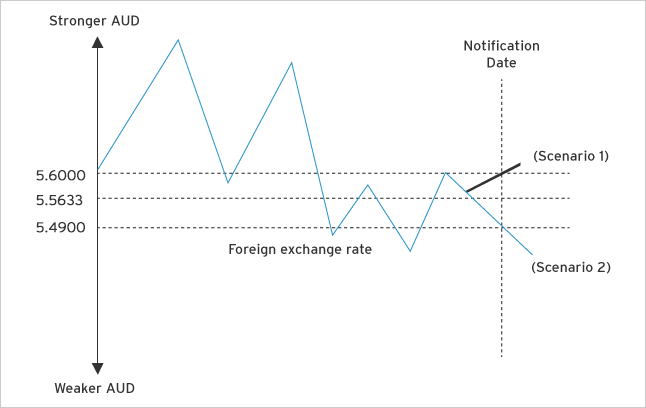 If the base currency is AUD and the alternate currency is HKD, investors will receive the base currency, AUD, if the exchange rate on the Notification Date is lower than the Strike Price. Call your relationship manager or 24-hour Manned International Toll-free Phone Banking Services as below to find out more about foreign exchange investment. Premium Account is a structured investment product with an FX embedded option. Option transactions involve foreign exchange and other risks, including the possible loss of the principal amount invested. The investment decision is yours and you should not invest in a Premium Account unless you are satisfied that, or any intermediary who sells this product to you has explained to you that, the product is suitable for you having regard to your financial situation, investment experience and investment objectives. Investors hold the product to maturity. Termination before maturity is NOT allowed. When the base currency or alternate currency is RMB, the Bank will use the applicable offshore Renminbi ("CNH") exchange rates. Investors should not only rely on the product description and illustrative examples alone to make investment decisions. Please also refer to the Terms and Conditions for Accounts and Services (including risk factors) and the Disclaimer set out below for details. If you are in any doubt or have any questions, you should seek independent professional advice prior to investing in the product. Any investment is subject to the insolvency and credit risk of Citibank (Hong Kong) Limited (the “Bank”). There is no assurance of protection against a default by the Bank in respect of any payment obligation. In the case of the insolvency of the Bank, you may lose your entire investment irrespective of the performance of the foreign currency market and the terms of the Premium Account. Investors should understand that the Bank is acting as a principal in providing the product. The Bank and/or its affiliates may receive benefit from the origination and distribution of the product. Your purchase of the Premium Account should not result in a significant exposure of your total net worth to investment products and you should be able to accept the possible loss of the principal amount invested. There are risk factors listed in the account opening documents. Investors should read the relevant content carefully before subscribing to the Premium Account. The Premium Account is governed by the law of Hong Kong and each of the Investor and the Bank submits to the non-exclusive jurisdiction of the Hong Kong Courts. subject to investment risks, including the possible loss of the principal amount invested. This means investors may effectively incur a loss on the principal amount invested. The maturity proceeds in respect of a Premium Account will be repaid in the currency that is the weaker of the base currency or the alternate currency (depending on the exchange rate on the Notification Date and subject to the Bank's total discretion). This means investors may effectively incur a loss on the principal amount of the Premium Account, because the amount repaid at maturity, when converted back into the base currency at the prevailing foreign exchange rate, may be lower than the amount of the base currency that investors initially invested. The higher rate of interest investors earn under the Premium Account may not compensate them for this foreign exchange loss. Investors should also note that a Premium Account is an investment product that should be held to maturity. Termination before maturity is not allowed. When the base currency or the alternate currency is RMB, the Bank will use the applicable CNH exchange rates. The CNH exchange rate may be different from the CNY exchange rate. RMB is currently not freely convertible and the conversion of RMB is subject to certain restrictions and it may not have an active secondary market. Investors may not receive the full amount in RMB upon maturity. Investors may therefore wish to seek independent professional advice before making a commitment to enter into a Premium Account. In the event that investors choose not to seek independent professional advice, they should carefully consider whether a Premium Account is suitable in the light of their own investment objectives, financial position and risk profile. All obligations herein are payable solely at and by Citibank (Hong Kong) Limited, subject to the Laws of Hong Kong (including governmental actions, orders, decrees and regulations). Investment products are not available for U.S. persons and might only be applicable to limited jurisdiction. If there is any inconsistency between the English version and Chinese version, the English version will prevail.